Hayfever season hit me last weekend and I spent an afternoon sneezing and snuffling around. 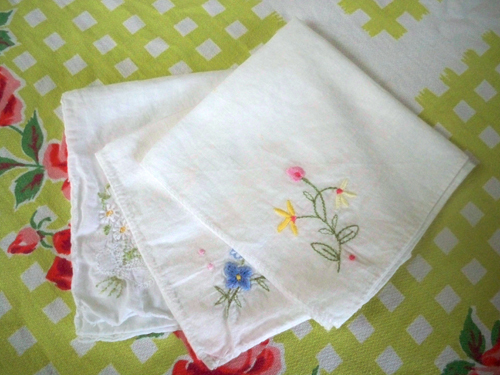 I think these old fashioned hankies I found at Pearl River Mart in NYC are cute and a nice green alternative to the entire box of kleenex I could go through. They remind me of my grandma. She always has a hanky stuffed in her pocket or even up her sleeve. I just flipped through her book at the store last week. Do you mean the curtains? Very cute. Ahhhh! I see! That is a great idea!